Cheating is an interesting phenomenon, especially when it concerns motivated students who cheat even though this can only have negative effects on their long-term learning. In the case of language learning, cheating is (almost) always bad for you. It’s not only morally questionable on exams, it’s stupid as well. Of course, if we’re talking about a language in school people take only to receive a grade, it’s understandable that some will consider cheating, because they aren’t really interested in learning. This is not what I want to talk about today. My guess is that most readers of Hacking Chinese are learning Chinese for more than just a grade (if you do care a lot about your grades you should read this: Studying Chinese when your grades matter). I can honestly say that I have never cheated on an exam in the more than twenty years I’ve spent in different classrooms, but I do cheat sometimes in an environment where it appears odd to cheat because there’s nothing to gain from doing so. My guess is that if I sometimes take shortcuts, the likelihood is that there are lots of other learners who cheat too. This is what I want to talk about. 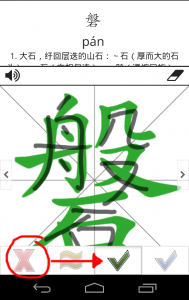 The cheating is related to spaced repetition software or any kind of program that checks your knowledge of Chinese through some kind of self-grading. In general, asking yourself (or having the program ask) you is a very good way of retaining knowledge. However, even if you get it wrong, all programs I know of allow you to go back and change the answer (and rightly so, you don’t want to reset the interval of a card just because you accidentally hit the wrong button). In some cases, you’re meant to just think or say the answer and then compare that with the correct answer. From a rational standpoint, however, this is completely ridiculous. The only reason we use spaced repetition software is because we want to learn Chinese, and pretending to know words better than we do is not going to take us closer to that goal. In fact, cheating increases the risks that we forget words and it will thus impede learning. The weird things is that there’s nothing to gain from cheating in this case, no-one sees your retention rate or your score for your reviews today. Even if someone did, they most likely wouldn’t care at all. You don’t earn a degree or a good grade. So, why is it so tempting to cheat, then? I don’t know, really, but I have two theories; perhaps you can come up with better explanations than I. If so, leave a comment! Before I do that, I just want to say that when I say cheating here, I don’t mean the deliberate kind of cheating that some students use to get better grades than they deserve, I mean an almost subconscious process that biases your self-grading in a positive direction, even though if you stopped and thought about it, you would know that it was wrong. Let’s get to my theories about why it’s tempting to cheat even if we will lose in the long run. First, it is painful to admit defeat. Forgetting a character or word that we really ought to know means that we have failed and that’s bad for normal people (but it really shouldn’t be). If we’re trying out a certain learning method that we really want to work, failing might also mean that the method is less effective than we thought. In this situation, it’s tempting to just change the answer. It’s tempting to cheat in this situation! Second, humans are lazy, which is another word for focusing too much on the short-term and ignoring long-term goals and commitments. In this case, if we have a backlog of reviews or a certain number we have to go through before we can do something else, it’s tempting to cheat because it means that the session will end sooner. Of course, this might mean that the next session will be longer or that we slow down our learning in general, but this is a long-term effect that we’re not well-equipped to deal with, at least not intuitively. I said above that I catch myself cheating now and then, but what actually matters is what happens then. Nowadays, when I find myself doing this (which isn’t very often), I just go back and judge myself harshly, sometimes even more harshly than I should. When doing this, I think to myself that this is for my own good, I will learn more Chinese in the long run by admitting that I didn’t know this word or by realising that I might need to review this again, even though I have 500 cards in the queue and I want it over and done with. Another mantra I have is that it’s much better to realise that I don’t know this word now compared with a situation where I actually need it, such as when teaching or using Chinese in an important context. This is actually very similar to my requirement for last year’s character challenge, where participants were supposed to ban or suspend any character or word that they had forgotten so that they could deal with it later. This was presented as a method to avoid rote learning and going on tilt, but it could also be a shield against cheating. By establishing a proper system for dealing with failure, we can take the next step and realise that mistakes aren’t all that scary, they are a natural part of the learning process. Do you find yourself cheating sometimes? Do you agree with the arguments I have presented? I could of course be completely wrong and be the only one who behaves like this, but I really don’t think so. My guess is that most people will spontaneously think that they cheat less than they do. So my suggestion is this: Pay attention to your behaviour when you use spaced repetition software over the next few days and report here. I’m very curious to hear what you have to say! Hi mr Olle.Im a reader from Brazil.Im starting to learn german and I use flashcards.I have one doubt.Which method is best in your opinion,No typing decks or typing decks? Do you mean typing the answers rather than just saying or thinking them? It’s definitely harder to cheat! All cards can’t be set up this way, though. Could you consider writing an article about what to do when you make mistakes using spaced repetition software. For example, I’m blazing through today’s cards. The card come up for WHO (world health organization) but I mistakenly take it to be 谁. Then I reveal the answer only to discover that I mistook the question for something else. How would you handle that. Also, how do you view tone mistakes? If I miss a tone on a phrase should I mark it as totally wrong? Generally, tone mistakes should be treated as equally serious as other major problems. 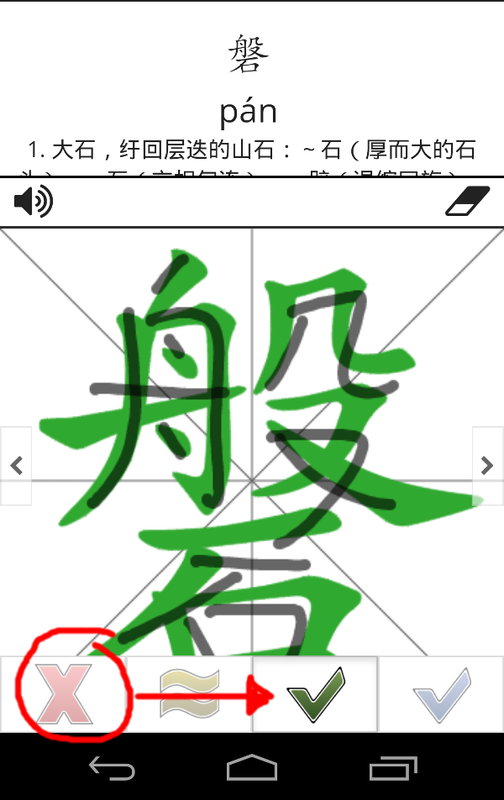 If the character is 中, zhong1 is the only correct answer, zhong2 is as wrong as zhang1. Your other problem is trickier. The obvious answer is to make better flashcards, e.g. WHO (organisation). If you do make a mistake, it depends on what software you’re using. If you think you know the word, go a head and give yourself a good rating (but not very good). If not and the word is important, give it a bad rating. I think it ought to be relatively easy to figure out if you know the word or not. I am really guilty of your second reason – cheating because I have an Anki backlog or don’t have enough time to get through them all. I realize this is not very logical but I find myself doing it anyway. On the other hand (just to play devil’s advocate and not at all sure I believe this myself) sometimes I think that I don’t do myself any favors by being overly critical and always choosing to fail myself (vs. just choosing a short interval) if it means I get through less vocab in each session. Most people have limited time for SRS. Is it always better to really learn 10 characters solidly than to sort of learn 30? Usually even if I’m hard on myself with Anki I don’t really consolidate my knowledge of the word until I see/use it in a real-life context a few times. I agree, but in that case, you should probably start deleting words that aren’t very important. Hey Olle. Thanks for that. 2 things from me. 1: Often there are multiple words in Chinese that map to one word in English. So things can get a bit tricky if on the front of the card there’s an English word. To remedy this I’m only adding vocab in 1 direction now*, Hanzi to English+pinyin, but some of my old cards have just English on the front. Sometimes I’ll recall the incorrect synonym but if I’ve used the other one recently in speech etc I don’t consider this cheating if I rate it as ‘good’. 2: One thing I’d like your opinion on. Sometimes I’ll say ‘good’ when it wasn’t infact ‘good’ because I know that the good option will bring that card back in 10 minutes anyway (this is relevant for new cards). What are your thoughts about this, is this cheating??? *I’ve started doing this recently as I’ve really started to accelerate my vocab learning. I’ve also hear of the ‘3 times in the wild’ rule, which states that you don’t really ‘know’ a word until you’ve heard it 3 times in the wild. I’ve found this to be quite true for myself so I figure there’s not point testing myself 3 different ways on a word on Anki, I may as well just learn Hanzi to P+E and then accept I don’t actually know it till I’ve used it in the real world anyway. Super interested to hear what you reckon. 3) Essentially what you said about defeat– sometimes I’m quite fed up with my slow rate of progress and I want something to show for my efforts. A high percentage of flashcards cleared feels quite good. I 100% agree this is bad practice… It’s quite hard to stop! Hahaha. It’s odd. The desire to cheat ourselves. We built the concept of ‘tests’ into our corporate spaced repetition application ( Wranx.com ) that allows automatic or guided tests to alert you if you are cheating yourself. The funny thing is, we only have to test you on the subjects you say you know well….. theres no point in testing you on the things you don’t know as you will fail! When using SRS and the and the question is multiple choice, sometimes I catch myself using process of elimination. Is this cheating? I sometimes give myself a “so-so”/”hard” or “good” even when I make a mistake in Anki or Skritter. I do this when I really *know* that it was just a momentary lapse (“a brain fart”). For example, when it’s a character that I know well and I just accidentally mistook it for a very similar one. These lapses tend to happen when I’m hurrying and I don’t give myself even two seconds to think about the answer. The other major cases are when I can recall some but not all of the multiple meanings of a character or word. If I decide that I only really care about the most common usage, then I’ll give myself a “good”. But if I am being strict with myself that day, I might mark it “so-so”/”hard”. I think that’s kind of a gray area anyway, but it allows me to use the flexibility of my internal goals as an excuse. I’ve experienced this phenomenon and have “cheated” sometimes with SRS. I think there are two reasons for that: I have correctly guessed the word before (perhaps on numerous occasions), meaning this time was just a slip; the other reason being I want to get the queue down. Thank you for the wonderful writing Olle. I indeed also catch myself sometimes in cheating in such a way. This is especially when using Anki. However in certain situation in Anki, I have the feeling that it is not cheating. You are just trying to take away the flaw in the software. I want to give a very concrete example. Sometimes you just forget the correct writing of a Chinese character (in my case Japanese, but it’s all the same anyway). When that happens you have the click the “Again” button. If your card is quite new, it does not matter so much, but it is especially painful to click the again button when the “good” button would ask the card three months later. So it means just because you could not remember a small thing, you loose EVERYTHING. Sometimes I feel that it is one of the drawbacks of spaced repetition software. You can loose everything just because of a small error. So in my opinion spaced repetition software should build in options to make cards that you have studied earlier graduate faster. I understand this. I just as often downgrade a result as I might upgrade it. Certainly isn’t always easy to decide. I am always a bit worried that I don’t learn well enough with spaced repetition though. I’ll probably I talk about that in a future blog post – after I teach a class about the benefits of it. Still I really feel the one that has been most helpful for me is Skritter. Yet progress always seems to slow to a crawl with any SRS after a while, and perhaps that increases “cheating” as you say. I just like to vary up my learning – bored of one thing, try another approach. Might not be the best, but it keeps up the interest.